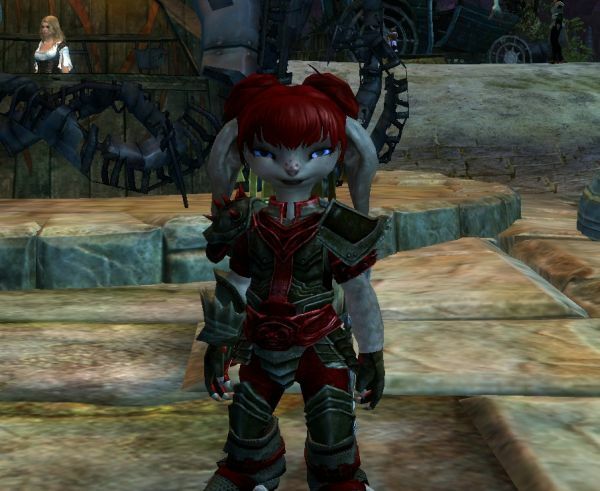 Dipping My Feet Into Some PvP #GW2 #GuildWars2 – Nomadic Gamers, eh! Thanks to some great blog posts by Rowan over at ‘I Have Touched The Sky‘ I decided to get my feet wet in some PvP in Guild Wars 2. One thing to keep in mind is that PvP is NOT WvWvW (world vs. world vs. world). You access it from your hero pane, and you port over to a completely different zone. You’re given a template character, with template gear, and you can sign up for what they call ‘structured’ pvp. There’s a few ways to do this. Number one, you can enter tournaments with a set team of players – or – you can join one of the 8 vs 8 teams already in progress. You’ll be randomly placed with a team of players, and you’ll be red or blue. You’ll be placed on one of a handful of maps, and the objectives are pretty much (from what I saw) all the same. First team to 500 points wins, and you are trying to take over as many areas of the map as possible (and of course kill your enemy along the way). I really enjoyed this pvp, even more so than the wvwvw that I had been participating in. It felt a lot more ‘relaxed’ to me, although it also moves a lot faster. It takes no time at all to reach 500 points, especially if you’re on a good team. Instead of dropping and having to sign up again what happens when you’ve won (or lost) is that you’ll move on to another map, in another random match up of players, and start over again. If the matches go by really quick this means you could be moving maps every 5-10 minutes, which can be a bit confusing (at least it was for me). I just stuck with someone from my team, because obviously there is power in numbers. I’m almost finished the first ‘tier’ of PvP which is the hare, or bunny, or rabbit tier, whatever it’s called. You earn glory (I think that’s the name for it) that you can use to buy gear as you move up through the ranks. There are a lot of them, too. Merchants open up for level 50 60 and 70 that I found. The introduction to PvP is quite well done, too. You’ll start out on the training grounds before moving to the actual sign up zone. You’ll have to complete three ‘hearts’ that are on these grounds, teaching you the basics of reviving an ally, and taking over an area of the map. After you’ve completed these three things you move to a larger map where you can work on getting familiar with whatever template you happen to be using, pick different weapons or gear if you’d rather not start out with whatever you have, and generally chatter with others in the zone about joining a tournament. Then it’s just a matter of talking to another NPC to get into an actual battle, and you’re off. Best of all, I had no queues, unlike WvWvW. Anyone else tried out PvP? What did you think of it? As always, happy gaming no matter where you find yourself! So far I haven’t even though about giving structured PvP a try because I thought people playing it would be more “This is serious business!” and get angry at my lack of PvP skills. While World vs. World would be easier to just get in, get massacred a little and then get out.